Mild manga spoilers to follow. 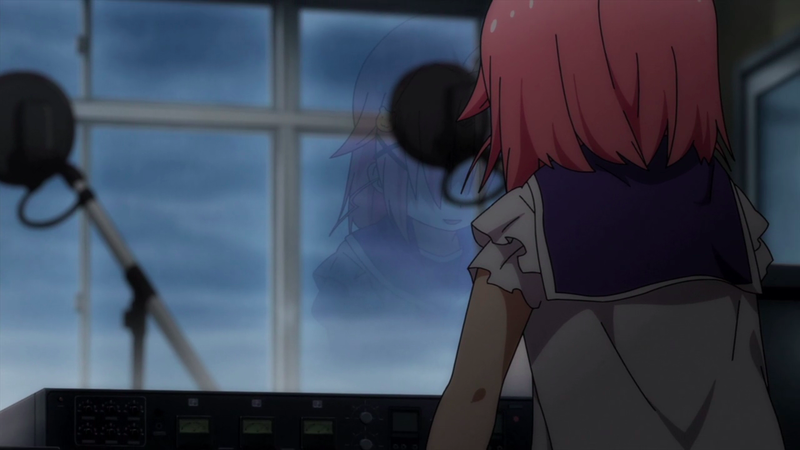 A primary difference between the Gakkou Gurashi manga and the recently completed anime is pacing. That’s not to say that one is paced better than the other, but that they move at different paces based on their medium. While there are equally desperate times as in the animated series, the girls’ world in the manga doesn’t crash down upon them as catastrophically. As previously mentioned, the anime uses a more traditional framing of the zombie apocalypse narrative, taken from films like Night of the Living Dead. Therefore, after holding out for almost the entirety of the series, everything breaks simultaneously – Taroumaru is bitten, Kurumi is bitten, the barrier collapses, the garden and power supply are destroyed in a fire, and Miki is trapped in the emergency shelter with no way out. This all sets the stage for Yuki Takeya’s awakening. For most of the series, Yuki had been shielded from the full scope of the situation by her classmates and teacher Megumi “Megu-nee” Sakura. In exchange, even with her shattered state of mind, Yuki had kept her compatriots sane by living rather than merely surviving. When everything falls apart, they continue to protect Yuki by sheltering her, each taking on a part of the emotional burden. Unfortunately, the situation is too much for Miki Naoki and Yuuri Wakasa, as the former is trapped in the emergency shelter on a mission to save the ailing Kurumi while the latter is forced to contemplate killing her friend should she turn. They leave Yuki alone in the classroom, but that’s not enough for Yuki, who is now more aware of the cracks in their overall demeanor. Stepping out from behind their protection is something that’s visibly difficult for Yuki, and speaks more to her love of her friends than anything else the series does with her character. Previously, she had recognized the long looks on the faces of her friends, but had gone about creating fun activities with the School Life Club to erase their tension and sadness. She can no longer do this when they’re pulled apart in different directions, inspiring a final push through her own mental blockade into reality. Yuki’s encounter with Taroumaru and her speech to the student body reiterates this. Gakkou Gurashi the series rewards her courage by recognizing the varying students’ remaining memories and allowing Yuki’s voice to somehow reach them, or at the very least herd them away long enough to save her friends. Like stepping out from behind the curtain that had closed off her mind, or later acknowledging graduation, Yuki finally comes to realize that moving forward is necessary. The watershed of events in the series’ penultimate and final episodes facilitate Yuki’s triumph. Yuki reaches a similar conclusion in the Gakkou Gurashi manga when she and Yuuri are separated from Kurumi and Miki. With Yuuri breaking down in the moment and no one else to turn to, Yuki bravely steps up and tells Yuuri that she’ll handle the situation herself. Rather than piling everything on at once, the manga slowly builds, with each character having their own respective moments of both weakness and strength. The events leading to the girls’ “graduation” and departure from the high school are not combined with Kurumi’s illness and vaccination. Dark, and tense moments are interspersed with lighthearted scenes – Yuki hamming it up on the radio at their “cultural festival” – before immediately launching into the bitter defeat of perceived rescue gone wrong. When Yuki steps up, she does so before she herself commits to saving her friends, as her voice reaches Kurumi and Miki through the intercom system. Rather than relying on latent memories in the zombified students, Yuki’s voice in the manga inspires her closest friends. The effect is that – with constant rising and falling action – everyone grapples with their inner demons at separate times, but cover for one another when necessary, including Yuki. Gakkou Gurashi the series relies on a traditional narrative climax, where the manga slogs through the everyday. There are lesser emotional highs in the latter; however, it makes up for it with a far more nuanced approach to the individual characters themselves. There are key takeaways to be had from both stories and, one’s attachment to one form of Gakkou Gurashi over the other will likely depend on the type of narrative that said viewer, or reader, is inclined to favor. Well said. The anime being strictly constrained to 12 episodes worth of content definitely allowed it to follow the common, yet effective, interest curve we’ve all come to know and love. On the other hand, the manga has to regulate it’s intensity to prevent desensitization to its strongest elements, which manifests itself in the more drawn-out style that takes advantages of deeper characterization. I just think it’s amazing that this discussion can occur. Anime deviations are often met with harsh (admittedly often deserved) criticism, but for Gakkou Gurashi!’s adaption to work so well speaks volumes to the ability of the staff behind the show. Not sure what you mean by “work so well.” Lots of people hated it, and it flopped hard in Japan. Personally, I think it diverged way too much from the manga. Some changes are to be expected considering the difference in format, but they went well beyond that. That’s probably why it didn’t sell well. I would definitely agree that a large part of the flop was due to the divergence from the source, but even so I think it did pretty well for attempting to rewrite a series. It did flub it’s way through certain areas and cut more than I would have liked of the extremely powerful scenes from the manga in favor of some moe moe montages. The biggest change is definitely the increase in Taroumaru’s role. His heightened reasoning and acting abilities didn’t aide the discussion of survival created by the group’s core, but it did help to give greater weight to Miki’s story, a more meaningful focus in the anime for the sake of a heightened sense of closure. To this end, I think that it was alright for Taroumaru to have an increased role. Overall though, I think I’m just really happy to see an anime veer off into an original direction that wasn’t absolutely garbage. I’m trying to treat the two as separate entities as the goal of their stories within the same frame were slightly different. I personally liked the manga better, and that’s coming from someone who loves a good zombie horror film. This is primarily because the characterization of the girls is a lot more nuance – which as you already said has a lot to do with different amounts of time allotted to each respectively. 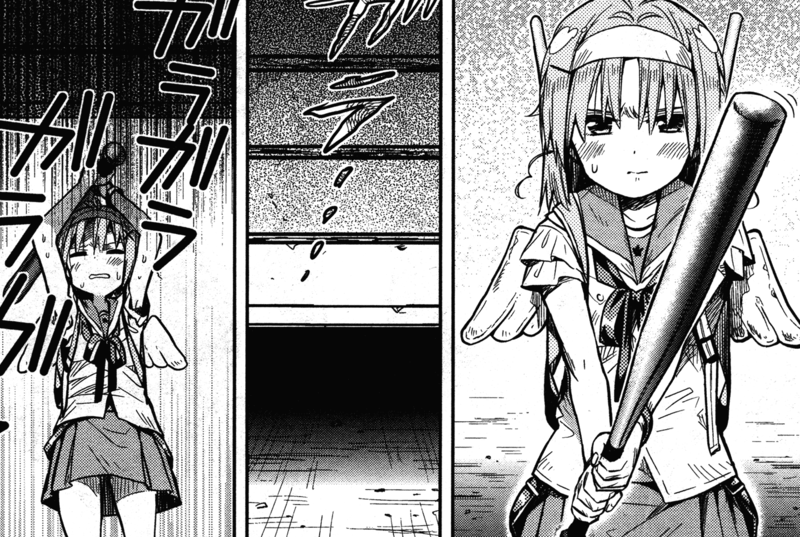 Another interesting thing is that many slice-of-life cute girl series are heavily reliant on character interaction, but because Gakkou Gurashi has the zombie horror narrative as well, some of that character nuance found in the manga or perhaps in another slice of life series is lost. I’ve seen a few people complaining that they couldn’t get emotionally-invested in the anime character narrative, which is a valid criticism. However, I do think that Gakkou Gurashi received an interesting and worthy anime adaptation from people who seemingly cared about trying to tell a good story. I like that it wasn’t afraid to change things up and deviate from the source material in an attempt to focus more on a few key stories in a shorter timeframe rather than slowly progressing everyone’s narratives simultaneously and switching between them. It also leaves things open for a sequel while coming to a natural stopping point, which is something that a lot of manga adaptations struggle with. I don’t think the shorter timeframe is a valid justification for many of the changes they did. To be honest, with 12 episode, I think they could have covered the first 30 chapters just fine if they didn’t waste so much time with Taromaru hijinks and other meaningless stuff. I think at least 2/3 of the changes were done because the head writer was the same guy who writes the manga and probably wanted to experiment, and not because they were forced to do it by format constraints or timeframe. I’ve heard a lot of very positive things about this anime and must admit I feel into the trap of not being interested because it was a “cute girl anime.” But this and every other review is really convincing me to give it a try. I love a good survival story and I also love anime’s that play with my expectations. Great analysis. Thank you. I will say this, if you feel like you’re not particularly enthused by the characters themselves by the conclusion of the third episode, it’s probably not for you. As I mentioned in a previous comment, a valid criticism of this series is that it relies heavily on the viewer’s emotional investment, but doesn’t cultivate that as well as its original source material. I say three episodes because the third episode is wholly different in both tone and cinematography, giving you a good range of what the series itself is capable of. Thank you for writing. Your first two articles on School-Live! and some pressure from the IGN Anime Club got me into this series, and it has impacted me quite a bit. Despite loving the anime, the manga would probably appeal to me more. I prefer subtlety over climax; character over plot development. Hopefully it doesn’t take years for the manga to get translated and sold in English. If you don’t mind my asking: I’m curious about the distribution of story-telling in the manga. In the anime, the character development wove itself into whichever plot operated at the forefront. I enjoy this technique, as it results in highly saturated content-per-second, which is important for any motion picture. Plugging screen-time for a character just to force a sense of equality almost always obstructs the overall story; and I’m happy to see that School-Live! didn’t fall into that poor design choice. As a result, however, it felt like Kurumi received disproportionate attention while Yuri’s character can only be studied from her actions. Does Yuri have her personal stories in the manga? I can’t recall even a single moment of introspection in the anime; and I’m curious about whether this was intentional design by the source material’s author, or if the plot developments closer to her character simply didn’t make it into the anime. Yuuri gets a bit more attention, but… well, it’s hard to explain without going into spoiler, but let’s say manga Yuuri isn’t very mentally resilient and as the story progresses, things get more hard for her to bear and the manga explores all that. The manga in general is more dedicated to show how everyone deals with things, so there’s a lot more psychological drama than in the anime. Also this articles is a bit misleading. It’s the true the manga doesn’t lump all its climatic moments together like the anime did, but it does have pretty strong climatic moments. There are moments when it really seems like the world is crumbling down on them. I agree that focusing primarily on Yuki/Megu-nee worked well for the anime, especially with the amount of time given. Yuuri has a lot more personal stories in the manga, and it has actually – in the latest few chapters that have been translated – entered an arc where her personal development seems like it will be a driving force of the narrative. You also receive a lot better sense of her own personal struggles and what weighs on her mind, which is something that’s only briefly hinted at in the anime, if at all.